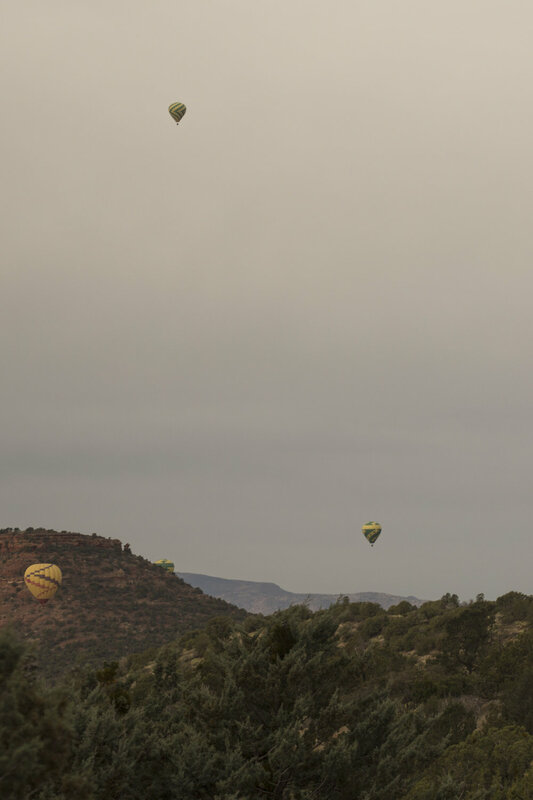 Between trips home to New York, we spent two weeks boondocking around Sedona, AZ. This destination has been a bucket list item for quite some time, so we were happy to finally experience it. You can find hiking and camping tips below that we learned from our 14 days spent in Red Rock Country. 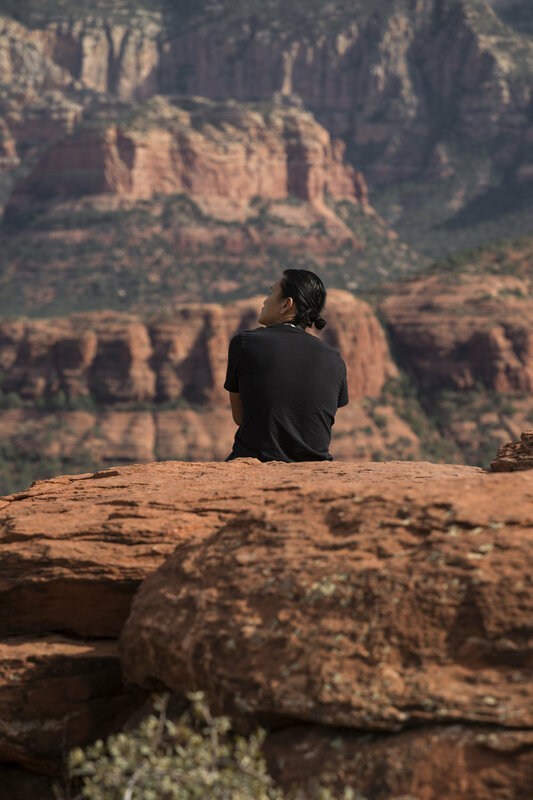 Sedona is said to be a very spiritually healing place. There are 4 main sites of vortices that attract people from all over the world including Airport Mesa, Bell Rock, Boynton Canyon and Cathedral Rock. A vortex is a highly energetic area of the earth conducive to meditation and self exploration. We explored these sites and didn't feel the 'energy' and same with the people around us, but the scenery was still magical. What we didn't expect to find was a huge scene of mountain bikers. Most of the hikes are shared trails of hikers and mountain bikers, and some even allow off road vehicles to join. Red Rock Pass is a required fee when entering Red Rock Country that goes towards the preservation of the area. You can purchase a weekly pass for $15, or your annual National Park waives the fee. We got free maps and useful information at Sedona Chamber of Commerce in the more touristy 'uptown' area. If you're in a large vehicle like an RV, it's tough to maneuver around Sedona due to narrow roads. Most trailheads do not have oversized parking. We are 24' long and arrived at trailhead parking before sunrise to secure a spot. Spots fill fast. We wouldn't recommend any vehicle longer than 24' to park at most trailheads. Be cautious of parking signs, we saw a lot of visitors with tickets. Tea Cup Trail to Devil's Kitchen Our first hike in Sedona was recommended to us, but we found this trail to be geared more towards mountain bikers for its twists and turns. We hiked an easy 1.75mi out to Devil's Kitchen and returned back the same way on Tea Cup Trail. Bell Rock does have space for oversized vehicles! We frequented Bell Rock due to its multiple trails and we mostly stayed south of Sedona to avoid tourists/traffic. This is a vortex destination, however we never found it to be too busy. 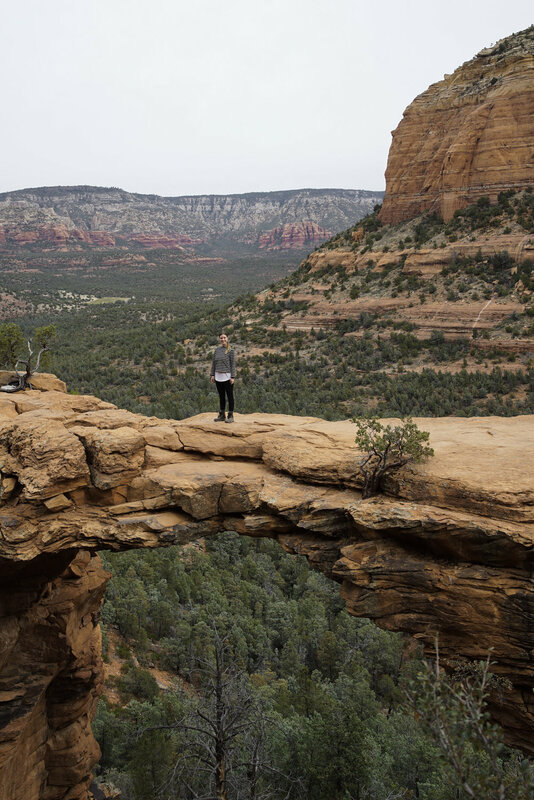 Devil’s Bridge is by far the most popular hike in Sedona. It's an easy hike that leads to a natural arch where hundreds of people on instagram want their photo taken standing in the middle of the bridge. There will be a line to get yours. The hike is easy, but filled with people. Minus all the tourists, the hike was still worth it but we found other trails to be even more beautiful. We left the parking lot before noon and there were cars parked a mile from the trailhead. Broken Arrow Trail was a very easy hike to Chicken Point offering beautiful views of all the red rock formations Sedona has to offer. This is a big spot for off roading vehicles. Cathedral Rock Trail was pretty difficult to park at, but we got lucky with a spot. We didn't research this hike and we were glad we just went for it. Begins easy then quickly becomes more climbing than hiking. Going up the rock seemed to be more frightening than coming down for most. The trail says it's only .07 mi, but it takes you to summit. When we got there, it opened up to the other side and we were pretty shocked at the beauty found there. This was our favorite hike in Sedona. We found great Bureau of Land Management areas to boondock overnight just west and south of Sedona. You can easily find most spots on the Campendium app. 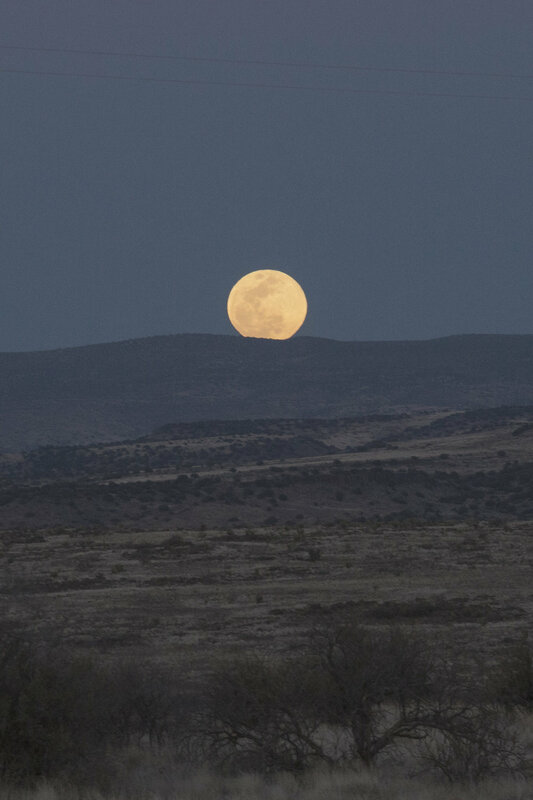 When camping on BLM, please remember the Leave No Trace policy. We unfortunately found a few spots around Sedona to be trashed with litter and clothing. Loy Butte Road BLM (free) This is a long stretch of unpaved road with pullouts for overnight camping offering great sunset views of Red Rock Country. Beaverhead Flats Road BLM (free) Right off the main road where you can hear light traffic, but not over the coyotes. Less spots than Loy Butte, but there was always space. Dead Horse Ranch State Park ($40) After a week of living out of the RV, we needed to replenish our water and also take hot showers. This campground is located south of Sedona in Cottonwood which is a smaller uninviting city, but the campground is located in a beautiful park. We biked the trails and enjoyed our time there. Clean facilities and spaced out sites. Would recommend. Montezuma Castle National Monument is a beautiful way to see how natives used science to shelter themselves throughout the seasons. Preserved over the years for our enjoyment of viewing and knowledge, this handmade home was built into a cliff for protection next to a creek providing them life. There is a fee to enter or use your annual National Park. Arcosanti is an experimental town started by Palo Soleri back in the 70's. Combining architecture and ecology, the goal is to limit destruction on our environment and to connect individuals working together in a community. Our friends Kelly and Bryce had just finished their 5 week workshop there, and when we visited we caught one of them who gave us an extended tour and information how Arcosanti sustains itself, mainly off of profits from the bells made on site.